Shanti is the Hindu Students Organization of Dartmouth College. We were founded in 2002 by student and community members in the Dartmouth area interested in practicing, learning about, and representing the Hindu faith. In 2005, we were graciously given a temple in Rollins Chapel which we continue to use to this day. 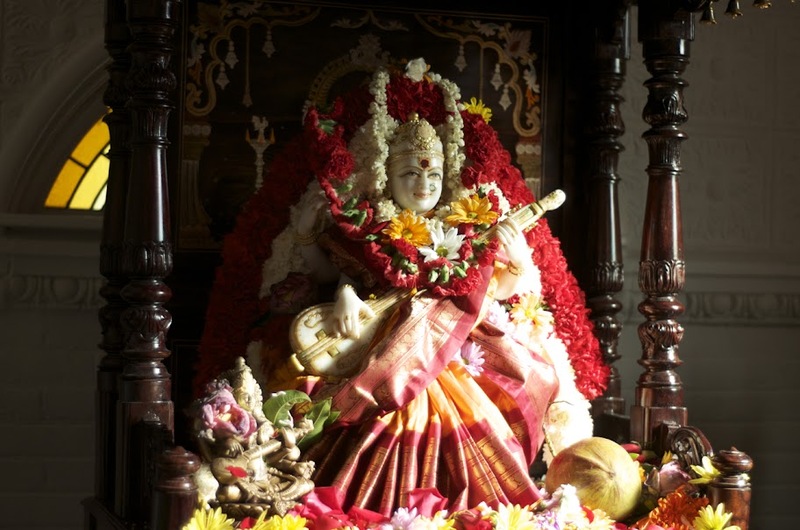 In February of 2012, the temple received a new vigraham of Saraswati, the goddess of knowledge, along with a significant renovation made possible through the efforts of dedicated volunteer students and community members. Our most regular event is a weekly puja every Friday evening at our temple in Rollins Chapel. This is the best time to come and get to know us and learn about Hinduism at Dartmouth. All are welcome, even if for only a few minutes. We strive to maintain a relaxed, open environment where anyone can come and participate as they please. Recently, we have also started having short, daily pujas at 7pm. These typically only last about a half hour and are ideal for anyone who can't make the Friday pujas. Please feel free to come by! Shanti hosts campus-wide celebrations during the year to commemorate important Hindu festivals.Our most notable campus-wide festival is Diwali, the Festival of Lights, which takes place in the Fall. The day-long celebration involves a service in Rollins chapel, the lighting of thousands of lamps across the Green and a dinner and cultural show put on by student and community members. Each May, we hold a Nritya Vasantham festival to celebrate the coming of Spring. The celebration includes a home-cooked dinner and performances by community members and student performance groups. If you have any questions or concerns, please don't hesitate to contact us at <login to see email address> or visit our website at www.dartmouth.edu/~shanti!